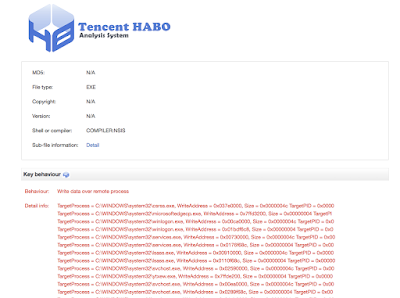 Malware analysis sandbox aggregation: Welcome Tencent HABO! VirusTotal is much more than just an antivirus aggregator; we run all sorts of open source/private/in-house tools to further characterize files, URLs, IP addresses and domains in order to highlight suspicious signals. Similarly, we execute a variety of backend processes to build relationships between the items that we store in the dataset, for instance, all the URLs from which we have downloaded a given piece of malware. One of the pillars of the in-depth characterization of files and the relationship-building process has been our behavioural information setup. By running the executables uploaded to VirusTotal in virtual machines, we are often able to discover network infrastructure used by attackers (C&C domains, additional payload downloads, cloud config files, etc. ), registry keys used to ensure persistence on infected machines, and other interesting indicators of compromise. 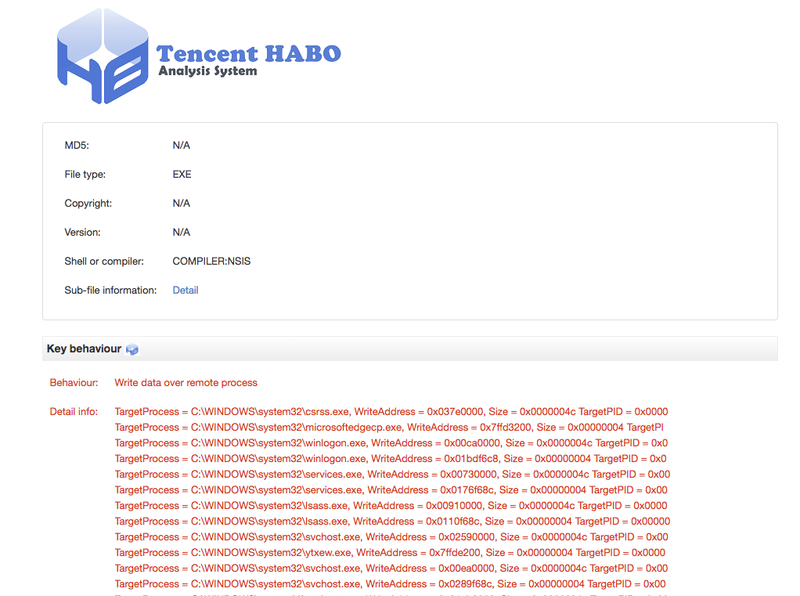 Over time, we have developed automatic malware analysis setups for other operating systems such as Android or OS X.
Tencent HABO was independently developed by Tencent Anti-Virus Laboratory. It can comprehensively analyze samples from both static information and dynamic behaviors, trigger and capture behaviors of the samples in the sandbox, and output the results in various formats. One of the most exciting aspects of this integration is that Tencent's setup comprises analysis environments for Windows, Linux and Android. This means that it will also be the very first Linux ELF behavioral characterization engine. Whenever there is more than one sandbox report for a given file, you will see the pulsating animation in the analysis system selector drop-down. Please note that sandbox partners are contributing both a summarized analysis and a detailed freestyle HTML report. On the far right of the analysis system selector bar you will see the sandbox's logo along with a link to the detailed HTML report. This is where partners can insert as much fine-grained information as wanted and can be as visually creative as possible, to emphasize what they deem important. We hope you find this new project as exciting as we do. We already have more integrations in the pipeline and we are certain this will heavily contribute to identifying new threats and strengthening anti-malware defenses worldwide.